You are here: Home / Uncategorized / A Budget Storm is Coming. Is Your District Ready for FLSA Changes? A Budget Storm is Coming. Is Your District Ready for FLSA Changes? A budget and compliance storm affecting employment classification and wages has been brewing for over a year and it will finally arrive on December 1, 2016. At the end of this article we are providing a free resource to help school districts prepare for FLSA changes. In the spring of 2015 President Obama directed the Secretary of Labor to update the Fair Labor Standards Act (FLSA) to reflect its intent, to ensure employees are compensated in an equitable manner for the work they perform for their employers. Human resource and legal professionals speculated rules that determine if employees are “Exempt” or “Non-Exempt” from overtime compensation. It turns out they were right and the changes could have a significant impact to wages for many district employees. On May 18, 2016 the Department of Labor (DOL) announced the Final Rule for overtime under FLSA. This announcement effectively put employers across the country on notice to review current employee classifications and ensure they are compliant with new regulations by December 1, 2016. (We wrote extensively about the possible changes in this article about FLSA Changes in School Districts in case you want a more in-depth review of some of the information presented here). 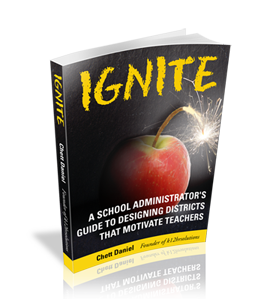 Typically classified or non-certified staff members are district employees who work in supporting roles and are not involved in the direct instruction of students. Usually these individuals are not required to possess state certificates in education. In contrast, certified staff members are typically teachers, counselors, principals and others who are responsible for the instruction of students. In most circumstances professionals in these roles must possess a valid state certificate in their respective field. It is important to understand that these identifiers- classified (non-certified) and certified have nothing to do with the six FLSA “white collar” exemptions. Exemptions under FLSA are: executive, administrative, professional, outside sales, computer employee, and highly compensated employees. A more detailed description of FLSA exemptions can be found on the DOL website. There are three exemptions in particular that typically affect schools: executive (often superintendent’s), administrative (typically directors, program managers, principals, and other department leaders), and professional (usually certified teachers directly involved in instruction). Most (but not all) certified staff fall under the professional exemption. School leaders will be happy to learn that little has changed within the FLSA regarding salaries for teachers and is likely not an area of concern. One big question is, “Do changes to FLSA affect teachers?” The short answer is no, but we’ll get to more of that later. The administrative exemption is the area that may have the largest impact on this school years’ budget. An employer can choose to classify certain employees as exempt under FLSA if they expect the position to have frequent overtime, fluctuating hours, or some other factor that makes sense financially and logistically to pay an employee salary and classify them as exempt. If an employee is classified as exempt they must meet three criteria, or tests. The employee must be paid on a salary basis. The employee must perform very specific duties to be considered exempt. The employee must also be paid (on a salary basis) a minimum salary. Fortunately, the recent changes to FLSA did not include any changes to the duty test. However, the DOL has announced drastic changes to the salary test. The change is expected to affect 4.2 million workers nationwide. The change will entitle most salaried white collar workers to earn at least $913 per week or $47,476 per year. The new salary requirement or test that will take effect December 1, 2016 is more than twice the old salary requirement of $23,660 per year. So what exactly does this mean? Currently a district might employ a manager within the transportation department that is earning $40,000 annually. Imagine this employee works approximately 46 hours per week. Since the employee is currently exempt (under the old FLSA rules) the district does not have to pay overtime. Under the new FLSA rule effective this December the employee would not meet the salary test and the district must make a decision. Either raise the manager’s salary $7,476 to maintain their exempt classification (since beginning Dec 1 the salary requirement will be 47,476), or reclassify the position as non-exempt and pay the employee overtime for all hours worked over 40. At this point it becomes a cost-benefit analysis. The district needs to determine if it will spend more money paying for overtime than they would if they raised the manager’s salary to meet the new minimum salary requirement under FLSA. Districts should also assess policies like work issued technology. If the manager in this example is reclassified non-exempt and has been issued a smartphone or laptop in order to work after hours, he/she will need to keep accurate time keeping records and be paid for those work hours too. These changes will affect districts both small and large. Smaller districts may have director level positions that are currently earning less than the new salary minimum and have more difficulty absorbing wage increases. Larger districts are more likely to have larger numbers of staff members serving in mid-level exempt positions and will be faced with either providing salary increases, paying overtime, or reclassify employees as non-exempt and reallocate duties to prevent, to the extent possible, the number of overtime hours the district has to pay. At this point you may be thinking “There is no way I can afford to pay all the teachers in the district $47,476!” No worries. The FLSA rule change does not apply to bona-fide teachers. Under the professional exemption teachers have a special exemption that excludes them from the salary test. Additionally, the DOL clarified rules that allows some district employees within the administrative exemption to be excluded from the new salary test as well. The administrative exemption is also available to employees compensated on a salary or fee basis at a rate not less than $455 a week ($913 per week under the new rule), or on a salary basis which is at least equal to the entrance salary for teachers in the same educational establishment, and whose primary duty is performing administrative functions directly related to academic instruction or training in an educational establishment. Academic administrative functions include operations directly in the field of education, and do not include jobs relating to areas outside the educational field. Employees engaged in academic administrative functions include: the superintendent or other head of an elementary or secondary school system, and any assistants responsible for administration of such matters as curriculum, quality and methods of instructing, measuring and testing the learning potential and achievement of students, establishing and maintaining academic and grading standards, and other aspects of the teaching program; the principal and any vice-principals responsible for the operation of an elementary or secondary school; department heads in institutions of higher education responsible for the various subject matter departments; academic counselors and other employees with similar responsibilities. As a result, positions identified here and other administrative school district positions that are not directly related to academic instruction will be affected by changes under FLSA. What Should Districts Do About FLSA Changes Now? Begin the process of auditing employees who are currently classified as exempt. Remember employees must be paid on a salary basis and meet both the salary and the duty test must be met for an employee to be classified as exempt, meaning if an employee is classified as exempt, they must perform exempt type duties. The earlier districts are able to audit and make decisions on how to classify employees based on a cost-benefit analysis, the sooner they can make appropriate adjustments to the district’s budget. Do not wait until December to review employee exemptions and make preparations. It’s not uncommon for attorneys in some areas to purchase commercial time on TV and radio stations in efforts to “educate” the public at large about possible wage and hour violations they may be experiencing and encourage them to call and discuss their case with an attorney to see if they have a valid case. An article from the Society of Human Resource Management reported nearly 90 percent of employment class actions are wage and hour cases and the DOL estimates that 70 percent of employers are violating the FLSA in some way and in many cases they don’t even realize it. One way districts can mitigate claims of intentional wage violations is to develop an overtime safe harbor policy in writing that tells employees, “If we make a mistake with overtime [hours worked] in error, you let us know and we will correct it.” Another, but more unpopular policy many employers adopt is to hold employees accountable for unauthorized overtime. While employees under these policies may be disciplined for working overtime without prior approval from management, the employee must still be paid the hours worked nonetheless. This wage and hour storm has been in the forecast for nearly a year and a half. Make plans to adjust your budgets and classifications accordingly so you don’t get caught in the rain this December. Hundreds of school leaders and school district human resource professionals have taken advantage of a free resource we are offering to plan for changes to FLSA for school districts. 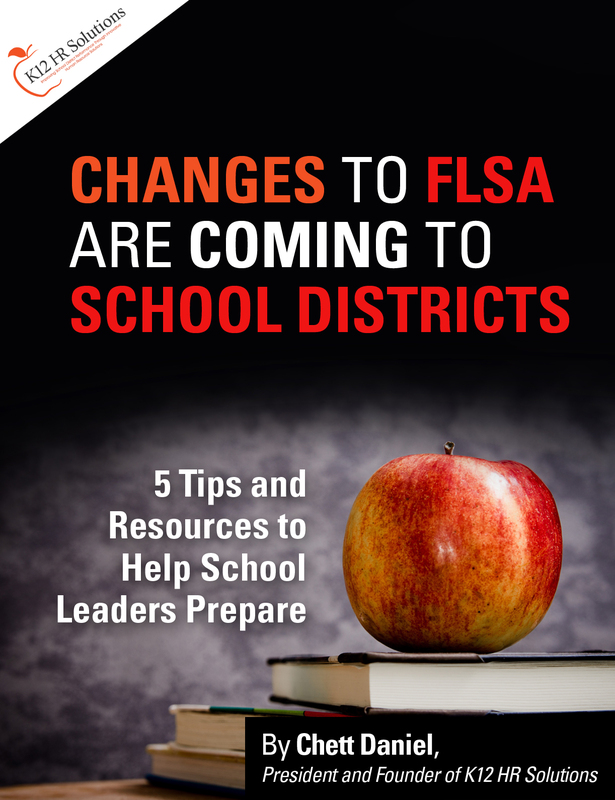 Use the link below to download resources to help you better plan for and budget for FLSA changes to school districts. If you need additional help to audit your district’s FLSA classifications, please don’t hesitate to contact us.